Settings: MakerWare .3mm/low with 5% infill (half as much as usual), on a Replicator 2, in about an hour. The black was added after printing with a Sharpie. 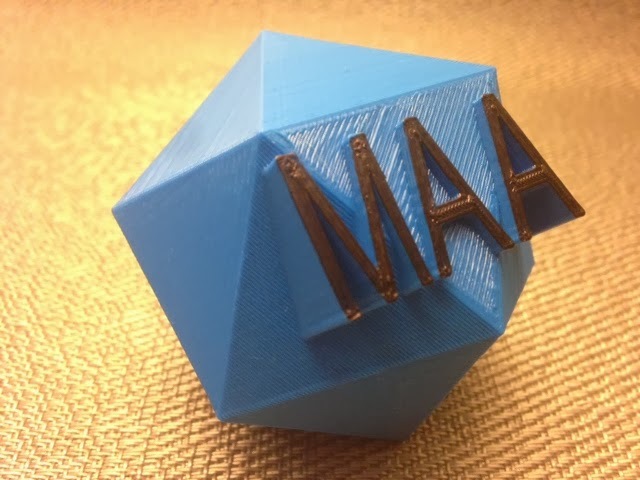 Technical notes: We printed hollow icosahedra on Day 32 and Day 100, but used a Community Shape Script file from Tinkercad that needed rotating to print on a flat face. Since I don't know how to rotate by non-integer degrees in Tinkercad, the rotation was not exact and some flat triangles had to be added to the top and base in order for the model to print correctly. Today we finally got off our Keister and made a new icosahedron, constructing the triangle faces explicitly using the polyhedron command in OpenSCAD. We used Harlan Martin's write.scad code from Thingiverse to add the text.